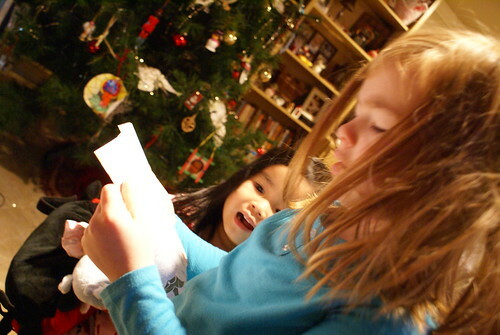 The girls enjoyed day two of their advent stockings this morning...or as Sophie Le likes to say, "Our Christmas socks." Haha! Their riddle today told them to look for their prize where they close their eyes. 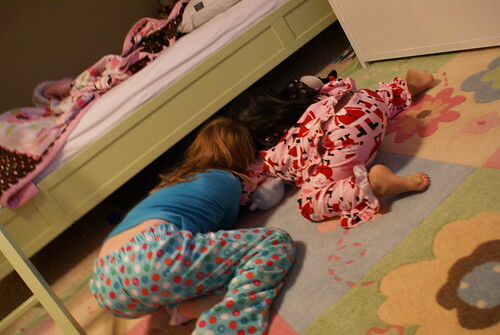 They ran as fast as their little legs would take them to their room. They are smart little cookies! Today's treat was their yearly ornament and pretzel M&Ms...Yummy!! 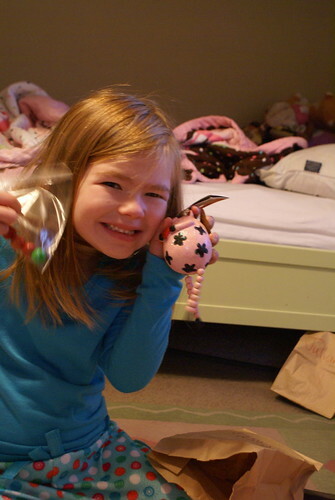 Hillary Ashton's ornament was a princess pig...it relates to some books she has enjoyed reading over the last month. 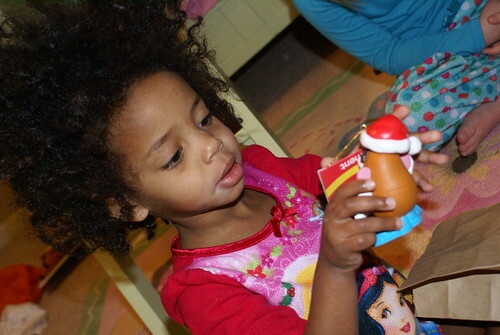 Julianne's is a Mister Potato Head from her favorite movie, Toys Story 3. Sophie Le's is a lollipop because she LOVES candy and suckers have become her vice lately. Tonight we all went to the movies. Yes, we ALL went :o) All six of us :o) I am so thankful (and surprised) that everyone did really good sitting through the ENTIRE movie! Whoo hoo! We all LOVED the movie and can't wait until it comes out on dvd...it's a buyer, for sure!! Before I forget, I also want to post about a special anniversary our family celebrated last Wednesday. Four years ago we received what we would ever refer to as a "Christmas Miracle." It was the call we had waiting for for two years. 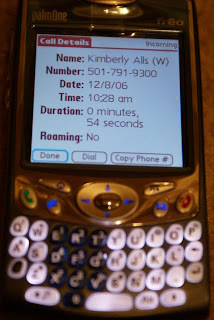 Actually, it is a call I had dreamed about for twenty years...you can read about that here. 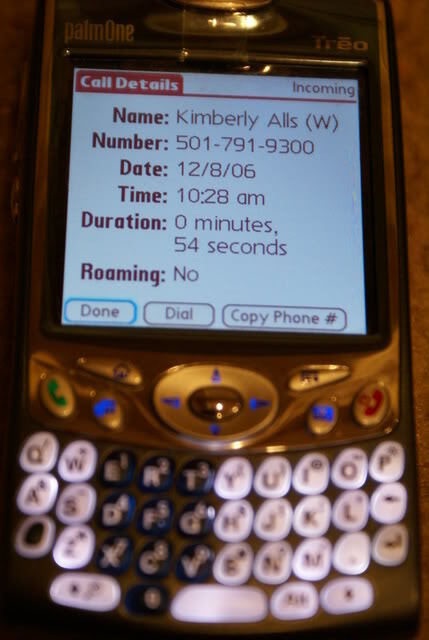 The call call came at 10:28 a.m. from our wonderful social worker. 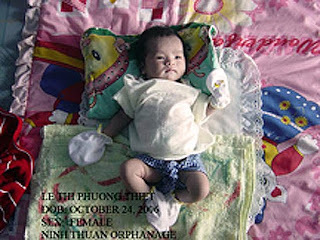 It was the call to tell us that OUR daughter was living in an orphanage in Southern Vietnam. We heard her name for the first time...Thiet. We learned the details of her life thus far. After we confirmed that this child was our daughter (a really tough decision...haha!). Our social worker asked us if we would like to see our daughter's face. It is amazing to think that at that moment, we had never laid eyes on our daughter...our daughter that was six weeks old. 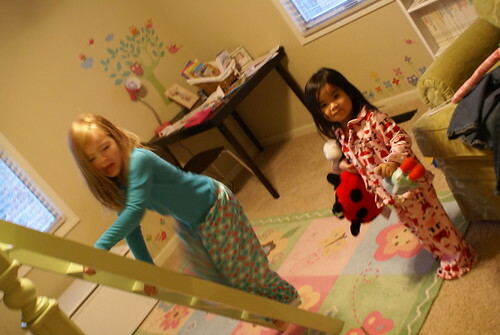 That just seems crazy to me now that we have had Sophie Le home for over three and a half years. How could OUR Sophie Le be living anywhere but with us? I remember sitting there at the large table in our adoption agency's office knowing that OUR daughter's picture was one the piece of paper in our sw's hand. The picture that was taken in a rural village, uploaded (on their VERY slow internet connection) and sent to our agency in Oklahoma (who prayed over it), sent it to our caseworker in Arkansas (who prayed over it) and now it was sitting less than three feet from us. I will never forget seeing her perfect little face for the first time. Hubby and I looked at each other and simultaneously said to each other, "That's her." The child we had prayed for. The child we had hoped for. The child we needed as part of our family. Forever more, Sophie Le Thiet will be our "Christmas Miracle." This morning at church, we learned of another potential "Christmas Miracle" for one of our other children. Only time will tell how this miracle will play out. We know the details are in HIS hands. I cannot share any details, but I would love for you to join us in covering this situation in prayer. Hi! I'm a new reader, and saw these advent stockings. I bought some small stockings after christmas in hopes of making something similar next year. How did you put it together and hang it?